Some RVers have learned the hard way when do-it-yourself electricians “plumb in” new RV electrical hookups at a campground. What happens sometimes is the campground will wire in 220 volts, when it should only be 120 volts, which results in high-voltage problems such as smoked wiring and burnt-out electronics. On the other hand, low voltage in your RV from an electrical system at an RV park can be another problem, which can also lead to unexpected damage and expensive repairs. As more and more RVs hit the road, packed campgrounds are common. 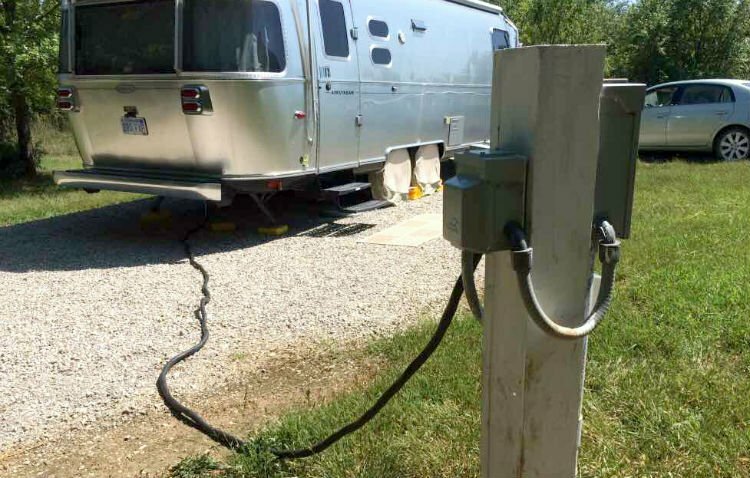 Some older RV parks may have ancient electrical systems that may not provide efficient power for newer RVs. Fill up the campground with modern units all demanding their share of the juice can lead to low voltage in your RV and all the problems that come with this. An A/C unit is one of the systems that are affected by low voltage in your RV. It requires a set amount of power to operate. If the voltage is low, the unit will still function, but it will operate hot. This puts a huge strain on the compressor motor. If given enough trouble, something’s going to break, and it won’t be cheap. What constitutes an unsafe, low-voltage situation? The National Electrical Code (NEC) indicates that 114 volts is the lowest acceptable operating voltage. That’s an excellent standard to reach for. But in the real world, 108 volts may be the lowest operating voltage that can squeak you past potential damage. If it’s any lower than that, your compressor motor can give up the ghost. This can be very expensive to repair. Other equipment (particularly anything with a motor in it) can likewise cause damage by low voltage. Plus, low voltage in your RV can take a toll on sensitive electronic gear, thus bringing on a premature death. Happily, there’s more than one way to protect your RV. At the low end of the price range, buy, install, and use a power line monitor. This simple plug-in device shows the system voltage and some models can indicate whether the campground outlet is wired safely. To use the device at a campground, simply plug the monitor into the site’s electrical outlet (you may need to use one or more adapters to connect to the power). 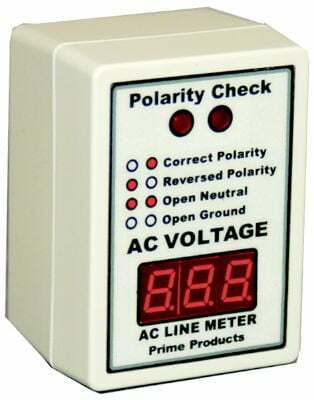 Verify that the power monitor shows “good” wiring—no reverse polarity, no “no ground” situations. Any of these indicators can lead to safety issues. Once hooked up, the monitor can be plugged into an outlet inside the RV, allowing you to keep an eye on the campground line voltage at any time. Also available are automated monitoring systems or surge protectors. These electrical devices plug in between the campground electrical supply and your RV. It constantly watches the voltage level. If the voltage drops below a safe level, it automatically shuts down the power to the RV until it returns to a safe level. There are also other units that provide protection against power surges and spikes. However, expect to spend more than $300 to equip your rig with this kind of protection. You can pump $350 to $450 or more into a system that not only monitors your power but automatically boosts it to safe levels without cutting power off to your RV. With the potential of expensive damage, protecting against low-voltage should be a high priority for all RVers. Im putting in a pedistal tonplug my camper in with three different breakers,built in. A 50amp 30amp and a 120 amp gfci receptical. What voltage gpes to the pedestal. Is it a 240 volt 50 amp circut and tge prewired pedistal will take care of the rest or what should it be. I no its,easy to get confused. You will end up bringing 120/240 to the pedestal….red wire, white wire, black wire, and green (or bare) wire. Red to white = 120v. Black to white= 120v. Black to red = 240v. The pedestal and the distribution panel in your RV do the rest to ensure that your equipment sees only 120v. I am a big do it yourself kind of guy but if you are confused I suggest you hire an electrician. The money you pay a pro might save your equipment or even your life. As an electrician (30 years licensed), thanks for advising to seek professional help. “Well, it works- sort of” isn’t the right way to go about things with power. Your comments are good to know about the Voltage at R V Campgrounds, Parks, Resorts etc and they need to known by others. Have you sent this to A L L the R V Campgrounds, Parks, Resorts etc in the US and Canada? And has it been sent to publications that cater to the management and owners of those places? I have gotten looks of confusion when I tell them the voltage in my unit shows that the park is supplying only 110 volts to me. That reading is on a the VOLT METER that “plugs into the wall outlet of the my RV. A few hours after I recommended to the manager that the transformer taps be adjusted to supply more voltage, the park supplied. Note the NO L OAD voltage is specified to be 120 – or + 5%.That is 114V to 126V.. I agree Leonard the parks should bring the power up to cover busy times when lots are almost or full capacity. How can the park bring the power up? Sorry if it’s a dumb question. There are stepdown transformers that take the higher voltage from to electrical poles feeding the RV park (usually much >1000V) down to what you use, 240V (50Amp plug) or 120V (30Amp plug). These transformers typically have multiple taps or adjustable points so the voltage output to you can be changed depending what the electric company supplies the campground. Voltage varies from what leaves the electrical power plant to the RV park due to transmission/voltage losses in the wires which is different depending how far you are from the power plant.. Your AC unit cannot run of of the 12 volt direct current system in your RV, so how that is affected by low battery charge is odd, same goes for the other 120 volt alternating current devices, like the receptacles and the refrigerator/ice box as you put it. When an RV is connected to an external power source, sometimes referred to as ‘shore power’, it runs the appliances and devices that run on 120vac and feeds the converter that changes it to 12vdc to charge the battery and run those things that run on the lower, direct voltage, like the interior lights, the furnace fan, etc. There is not a cross over between the two systems and the only connection is the converter which feeds power in only one direction. One thing I did not consider is that if you also have an inverter that converts 12vdc into something that closely resembles 120vac. That is common in larger RVs and something with which I have little experience with. One thing I do understand is that items that have large current draws generally aren’t suitable to be run from inverters for any length of time, depending on the rated capacity of the inverter. Regardless, if the inverter is taking power from batteries, it can draw down the battery charge rapidly if the device(s) have high current draw. I’ve been plugged in here at my home ever since bringing my 91 HR Imperial Class A 37 ft unit home. What I intend to do however, is have enough power somehow to not have to plug in anywhere for up to 3-4 days HOPEFULLY. So I bought the size gen I was told I would need to run a portable a/c or portable heaters, a couple of tv’s, microwave, normal charging of phone and computers, the fridge and a few lights. Obviously not all on and running at once and now people are like, “you cant use that gen in an RV, it’ll overheat, how are you gonna?, etc” Well, I was planning to also have enough batteries to power that stuff so that the gen would only be needed to RECHARGE said batteries in a location where it won’t disturb anyone etc. but now no one can or will tell me how many of what type batteries to get. Sheesh!!! For one, with 2 AC’s you’ll have 50 amp service. Not 30 amp. 30 amp is only good for one AC and a few appliances. This is what we have on our Airstream. Our 5th wheel had 50 amp service because it had space for another AC unit. That said, the batteries are somewhat special. We ordered ours on Amazon from Windynation . They are AGM batteries and handled the power use very well. I highly recommend AGM batteries, but I also highly recommend getting the right kind. It really depends on your setup because there are so many varieties of batteries. The best I can recommend is to look at the batteries you have and try to match numbers. There are some fantastic batteries out there, but they come in all kinds of sizes. So that’s where it’s up to you to make sure you get the same size and type that you currently have now. I had to actually look at mine and match them up to the exact model type on the Amazon page for Windynation. If they hadn’t had good pictures it wouldn’t have worked. With an older rig you have trouble matching battery types as well. That’s not to mention that you may have 24v batteries depending on your rig too! Ultimately, if you aren’t familiar with how to replace the batteries, then you may need to pay someone to help you out with that. I don’t envy you though. RV service help is painful and expensive. One of my pet peeves about the RV industry. Neither the residential, automotive, marine or aviation industries would tolerate the risk that the RV industry gets away with by its lack of monitoring and control of consumable usage. To raise the alarm and do the subject justice this article needs to be three times longer with illustrations and pictures of the damage, waste, injury and death that result. If you do not test the supply first, the damage is on you. I have recently purchased a Hughes Autoformers RV Voltage booster, which will reportedly serve as a surge protector and power booster for low power situations. I live in Nevada with temperatures in the low 100’s. In leaving for an extended trip, the warm temperatures often cause parks to have low power as they serve their guests and we, in turn, suffer as we leave the state for cooler temps. . Hoping to avoid the situation I experienced last weekend when power was at best 104 to 106 to the coach, prohibiting any significant power use. Would be interested in any feedback about the voltage booster and I will provide the same after our maiden voyage. I have a situation I’d like some advice on. I’m a techy guy, am a general class amateur radio operator and understand electrical better than the average DIYer. I’ve got a situation that’s got me baffled and a little worried actually. My Airstream is 30 amps. It’s plugged into a power post wired by myself and a electrician friend. We did it right and it’s worked for 4 years on 50 amps with a different rig. We got the airstream this spring and it’s been working fine till about a month ago. It’s plugged into a proper 30 amp circuit with a 30 amp breaker. Lately I’ve noticed voltage drop throughout the day. I have a voltage meter plugged into a receptacle all the time. In the mornings with nothing running I get 121v inside. Turn on the AC and I get 117-118v. Normal drop. Here’s the kicker: Throughout the day the voltage will drop to where by 5 pm it’s at 110v with only the AC on. AC off it’s at 115v. If I go out to the power post at this moment, the 20 amp receptacle there will show 121v. So I know the power from the power company isn’t down. Also, and even more worrying, if I turn everything off except for the bedroom circuit where nothing is plugged in, I get 115v inside, and 121v outside. I don’t get this. Why would there be a voltage drop from the post to the inside with nothing running? The circuit I test on is NOT a GCFI circuit so that’s ruled out. I already replaced my gen/shore power switch since it was starting to burn up at 12 years old (they apparently all burn up eventually). It was doing this before I replaced that switch as well. I also checked my ground/rod connections to make sure it was still connected. Additionally, this is causing issues with my AC compressor because it’s going into low voltage territory and overheating/overloading and shutting down for 20 minutes about once a day. Summer is almost over but we’ve still got another month of possible 100 degree heat and I’m at a loss as to what could cause this. Thoughts? Do I have a short somewhere? I have a very expensive surge protector that is supposed to stop brownouts. I thought it might be failing so removed it and there’s no change. The **ONLY** thing I can think of is that we are using a 35 ft power cord from the post when we could probably use a 15 ft. It’s a standard cord, but could there be enough power drop due to the sun heating up the cord and cause a more favorable environment for voltage transfer? I’m grasping at straws, but I know that electricity flows better when the environment is hot and that cord must be 160 degrees! Go for the short cord. Always less resistance. Your symptoms are classic corrosion in your electrics (wire, terminals, components, etc). Trailers are universally wired with inferior residential components that are not appropriate for the caustic mobile environment. The brutal truth is a band-aid approach is inappropriate here because your entire system has aged and therefore deteriorated. The solution is simple: rewire with marine-grade components, starting with stranded tinned copper wire and soldered terminations. My ocean yacht was wired this way 30 years ago and the electrics are sound today. I’m an engineer with lots of power experience….The problem with voltage drops over connected wiring is ALWAYS due to high resistance connections (probably multiple) somewhere in the path of the electricity. Resistance shows up as voltage drops across a connnection ONLY WHEN CURRENT FLOWS. The reply suggestion corrosion everywhere is not out of line. but is a little extreme. A high resistance connection is one which has either loosened or corroded. Both happen over time. Wires expand and contract with temperature causing them to loosen. Any resistance in a connection creates heat which over time, accelerates corrosion and increases the resistance. Start at the power pole. Plugs and sockets are usually just brass and corrode over time. Clean or replace them. Plugs don’t make the same contact as a probe does so probing does not tell the whole story. The plug is easy to clean with a dremel tool running a wire brush. The socket can be cleaned if (unpowered) disassembled but is often better to just replace it. This is likely the source of the low voltage between the pole and inside the camper. Shortening the cord will likely do little but you will fool yourself into believing it did if you buy a new cord to do it which has a new clean plug. Check voltage UNDER LOAD following the path of all connections. Go from the pole to the panel in the camper and measure across each connection, then tighten each connection and re-measure. The small voltage drops across connections should reduce or be eliminated. Best possible way to deal with terminal resistance is to cut (an inch off) and re-terminate if you have enough wire. This only improves the wire, but not the terminal connection but half is better than none. You can measure connection resistance with a voltmeter by probing both sides of the connection UNDER LOAD. A voltage of even half a volt across any connection is large. An experienced DIYer can do this but wear gloves and be experienced with multimeter probes. Getting an electrician to do this would be expensive and it may be better to just have him replace pole socket and cord, then cut and re-terminate the breakers. Wow! This was an extensive answer! Thank you! First, I think the issue I was having was not necessarily related to my rig. I’ve since been in several different RV parks and have had various voltage drops dependingvon usage in the campground. One park was pretty bad during peak usage with no load (on my end) input starting at 115v before I turned anything on. I found out this was the park because one day we had a black out and all the heaters reset in the rigs and the voltage jumped to 130v! Until everyone reset their heaters and then it dropped back down. I was not sorry to leave that campground. I believe part of my issue with burned contacts/cords and voltage drops is with buying cheap cords that don’t connect well. My new cord has developed an issue with burning one of the contacts as well. I’m thinking about getting my own ends to put on. The issue wasn’t as pronouced at a different campground so I’m pretty sure it was partly the connection at that one post. However, I recently bought some anti-oxidization goop to put on the contacts. I need to clean them up first and your idea of the dremel should work perfect for me. I’m thinking the idea of trimming the ends and cleaning up the contacts on the breakers is a good idea. After dealing with a transfer switched where one contact burned up over a period of time, it would seem that this could be the cause. Small amounts of arcing over a long period of time eventually creates a larger and larger gap which in turn resists more. I believe that one of my problems is that I am often using an adapter to plug into 50amps. More and more parks don’t even offer a 30amp plug anymore. This means if something goes wrong in my rig, the amperage has to climb to 50 amps to blow the breaker. This sounds bad to me. My question is: Is it worth it to build my own portable breaker box so I have a dedicated 30amp breaker outside? I’ve been in several parks lately that don’t have breakers at the post. I don’t like this for several reasons but my main issue is that if I forget to turn off my main breaker and just plug straight in, I’ll often blow a breaker inside because I arced the connections while plugging it in. Not good. Thoughts? I’d have to make the box waterproof. But I think the effort might save me some grief down the road. Maybe there’s a product for this already out there? Let me preface my remarks with a disclaimer that I’m no electrician. But in restoring an ancient beat up 12′ Security brand travel trailer to useable (not “restored”) condition for camping and fishing trips, I had to do some reading on electrical wiring. One basic principle is that the power will drop if the cable or wire is too long, or the gauge or thickness of the wire is too small in diameter. So knowing what little I know, I’d say try the shorter cable, but make sure it is of adequate gauge. While I’m at it, could there be any inadequacy of the specific specimen of your 35′ cable, in terms of its design or gauge of wires, or unseen defect or damage? Could something have happened to the cable since it was working with the older RV? Maybe something is amiss with the power center inside the Airstream. I once bought a 2010 24′ Forest River travel trailer. While it was still new, under warranty, maybe a year or so out, the electrical control center (I forget the technical name) went haywire. It boiled out my 12v deep cycle, and caused other problems. Nothing would run right, 120 volt appliance or 12 volt appliance. Finally an independent technician (Big Sky RV Repairs) came out and replaced the electrical brains of the trailer with a new, much better quality one. He remarked that the one Forest River had built in was a cheapie, inferior quality one. He did the paper work for me on the warranty claim. Never had any more electrical issues. I eventually sold it in 2015. It would be nice if an electrician or an expert could respond to your question. In the mean time, consider my 2 cents worth. Hi everyone! I am an electrician (I am also a HAM and electronics enthusiast) and reading most of these comments helps me to understand many of the service calls I go on. I would recommend that if you have no education in this area do not modify any systems. If in doubt bigger is generally better. Also buy the shortest extension cord you can to avoid voltage drop. Another comment I noticed was puzzled about the voltage difference from the pedestal to the RV. My first thought is you may have a bad neutral connection. As far as generators and batteries, don’t modify those systems on your own if you are unfamiliar with this subject. It is too easy especially in the automotive (or RV) world to cause a fire. There is a good possibility that next year when the electrical code is updated the code will outlaw Autoformers Reason because they steal power and lower the voltage from the next pedestal in the chain. Basically, you are taking power from some other camper and then they have low voltage. This a GREAT article! Thx so much for the education. I have a Lance TT 50 amp. If I get a 50 amp surge protector I’m covered for 50 amp service….. how do I cover myself if/when I only have the option of 30 amp? Will I need a 30 amp surge protector as well? Tara, you plug the 50 amp cord from your tt into your surge protector then plug your surge protector into a 50 amp to 30 amp adapter (you’ll have to purchase) then plug your newly purchased 3-pronge 30 amp adapter into the 30 amp receptacle. The surge protector will provide the needed protection. Excellent subject and very informative. I intend to follow this string. Another very good article with some very good advice…….. Best advice is always the same “if not 100% sure what you are doing” be safe and hire the pro.